There's nothing more sweeter in the minds of the Leone Lions Boys Varsity basketball team other than beating the Samoana Sharks in the final. 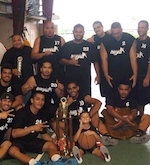 In last year's basketball season, the Samoana Sharks made the playoff in a must-win-situation over Faga'itua. They moved on to beat the Tafuna Warriors in the only playoff in double overtime, and then capped off their upsetting run by routing the favorite, Leone, in the final. Before Samoana's final with the Faga'itua Vikings, they sought the assistance of their JV players, Derek Tu'ufuli, and Simi Toeaina, to bolster their low post position which was a weakness during the season, and these two players became a formidable force. It was a win-win for Derek Tu'ufuli who won the Most Valuable Player in the final, and who was a dominant player throughout the playoff and the final as well. "He was the key player for their successful run in the playoff and the final. He uses his huge body so smartly and he was winning quality balls," said an ASHSAA official. Leone lost to Samoana in the first round this year with the score of 41-54, and their second meeting was canceled when rain downpour made Tafuna High School court unusable. The game would not of affect their standings, the first and second playoff spots respectively. In comparing these two teams, Samoana has all the essential factors to retain the championship. However, Leone has a scoring center, 'Ese Selesele, but he will be facing two tall Sharks, Derek and Simi, and would have a hard time scoring over these towering players, so he needs to shoot accurately from the field,. Samoana also has an accurate shooter in forward Lotonu'u Seagai, who is the leading scorer in this year's season, averaging 18 points per game. In the guard position, Leone has two fast ones, Sai and Fale, who will be facing Samoana's Ludvig and Richie. Fale is the best point guard with precise vision and perfect passing skills. Both teams can score from above the arch, but they should spread the court to capitalize on their 3-pointer attempts because of the rapid coverage of the opposing guards. If Leone forwards can score points in this particular game, that would lessen much burden from their center 'Ese Selesele, allowing him to score from the field. Samoana can score from all ranges of the court by their triple threats, Derek at the low post, Seagai from the mid range, and the "white ears" man, Ludvig, from the perimeter. Leone's leading scorer, Selesele, always scores points at the low post but he should be able to score from near the paint. Fale is another scorer for Leone, and he can always hit from above the arch, if given the chance. Samoana is the best team from the line - they usually prevail in most of their games from the line. If Leone fouls often, they will have a struggle on their hands.